Former CIA Deputy Director John McLaughlin wants you to believe the NSA wasn’t really reading Anwar al-Awlaki’s communications content, on whose emails (including the web-based ones) the NSA had a full-time tap at least as early as March 16, 2008. In my experience, NSA analysts err on the side of caution before touching any data having to do with U.S. citizens. In 2010, at the request of then-Director of National Intelligence Dennis Blair, I chaired a panel investigating the intelligence community’s failure to be aware of Umar Farouk Abdulmutallab, the “underwear bomber” who tried to blow up a commercial plane over Detroit on Dec. 25, 2009. And maybe that’s the case. Except it doesn’t seem to square with the report that two FBI Agents were spending 3 hours a day each reading Awlaki’s mail. It doesn’t seem to accord with the efforts those Agents made to chase down the Nidal Hasan lead — which, after all, infringed on the privacy of two American citizens, against one of whom probable cause had not been established. You’d think it would be far easier to chase down the Abdulmutallab messages, particularly given what has been portrayed as more clearly operational content, given that Abdulmutallab would have gotten no protection as a US person. Sure, those Agents complained about the “crushing” volume of the communications content they had to review every day, but that was a factor of volume, not any restrictions on reading FISA target Anwar al-Awlaki’s email. Don’t get me wrong. I’m thrilled someone has raised Abdulmutallab in the context of assessing NSA’s dragnet, which I’ve been calling for since October. And yet, he got on that plane. His own incompetence and the quick work of passengers prevented that explosion, while a number of needles went unnoticed in the NSA’s most closely watched haystacks. Nevertheless, the lesson DiFi takes is that we need more haystacks. Shouldn’t the lessons of UndieBomb 1.0 be just as important to this debate as the partial, distorted, lessons of 9/11? But for McLaughlin’s claims to be true then the description of the treatment of the Awlaki wiretaps in the Webster report on the Nidal Hasan investigation wouldn’t seem to make sense. By all means, let’s hear what really happened back between 2008 and 2010, when the NSA missed multiple contacts with top AQAP targets and TTP targets and as a result missed two of the three main international terrorist attacks on this country since 9/11. That should be part of the debate. But let’s be very clear whether it was really limits on US person data, when we see FBI reading content of two US persons directly, or rather the sheer volume we’re collecting (as well as the crappy computer systems FBI had in place in 2009) that caused the dragnet to fail. What was the first count that Umar Farouk Abdulmutallab — the UndieBomber — was found guilty of? Particularly given Lindsey Graham’s persistent tweeting yesterday that “the last thing we may want to do is read Boston suspect Miranda Rights,” there was a lot of discussion in the moments after Boston Marathon bombing suspect Dzhokhar Tsarnaev was captured last night about whether he would be read his rights. At first, there were reports he would be. But then DOJ announced he would not be read Miranda immediately; they would invoke the public safety exception to question him. As of about 40 minutes ago, he had still not been read his rights. Now, thus far, I’m actually not that worked up about Miranda rights (though I may get there soon). As Orin Kerr explains, the public safety exception is a legally recognized law, and Miranda itself only limits what can be admitted as testimony against Dzhokhar in his trial (I’m betting he’ll plead guilty in any case). The government appears to have so much evidence against him in any case, any confession he makes will likely not be necessary to convict him. Mind you, as Charlie Savage reported two years ago, the government has been institutionalizing longer delays before they give Miranda warnings, most notably with people they (or foreign proxies) interrogate overseas first, followed by a clean team Mirandized interrogation. And as the reference to “gain[ing] critical intelligence” above suggests, the Obama Administration is stretching the intent of pre-Miranda interrogations to include more substantive interrogation (update: Emily Bazelon also made this point). But here in the US, the delays on Miranda warnings aren’t that long. The best–quite similar–example is the 2009 UndieBomber, who was interviewed for about 50 minutes under a public safety exception when he was captured. That entire interrogation was deemed admissible and in fact formed a significant part of the opening arguments in his trial (which didn’t get much further than opening arguments before he plead guilty). So the UndieBomber’s case is one reason the Administration is confident they could question Dzhokhar without Mirandizing him at first (though the length of time has gotten far longer than used with the UndieBomber). There’s a precedent from the UndieBomber I find more troubling though. The judge in that case also allowed the use of UndieBomber’s statements from the hospital after he had been given a fair amount of sedation. While there was a dispute about how much he got and what kind of effect that might have had, conversations he had with a nurse were also used in the opening arguments of the trial. The two issues together — a suspect interviewed without a lawyer after he’s been given serious drugs, both of which will be apply to Dzhokhar, as well — is troubling on legal, humanitarian, and practical grounds. The High-Value Interrogation Group had already been brought in last night, which suggests he may well be asked questions while in precarious medical state. But the big issue, in my opinion, is presentment, whether he is brought before a judge within 48 hours. In addition to stretching Miranda, the government has also been holding and interrogating suspects for periods — up to two weeks for American citizens and far longer for non-citizens — before they see a judge. Not only does this postpone the time when they will be given a lawyer whether they ask or not (because judges are going to assign one), but it gives the government an uninterrupted period of time to use soft coercion to get testimony and other kinds of cooperation. In my opinion, two of the most troubling cases like this, both involving naturalized citizens accused of terrorism, are Faisal Shahzad and Manssor Arbabsiar. 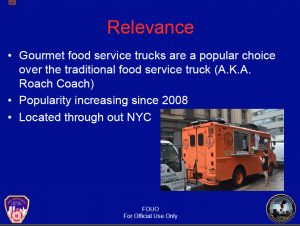 In a fit of fearmongering reminiscent of the Mobile Bioweapons Labs used to get us into the Iraq War, FDNY did a report last month warning about the use of food trucks by terrorists. 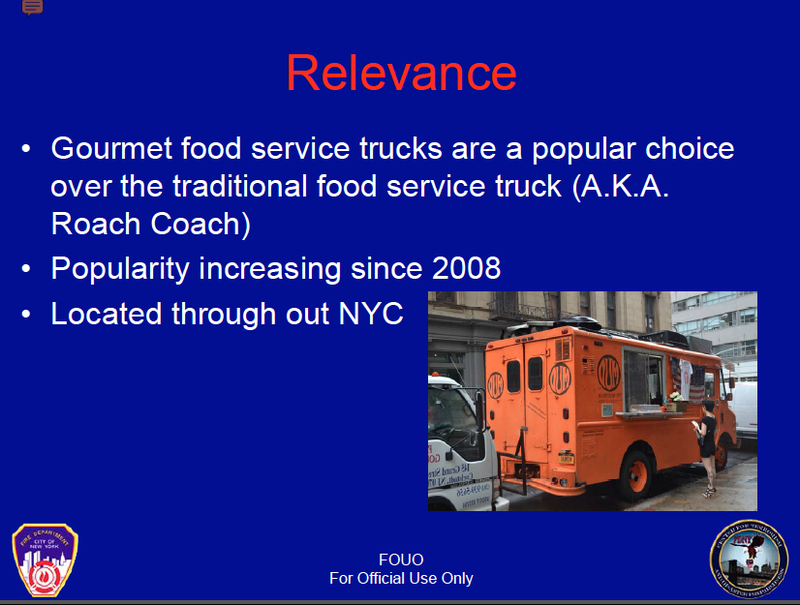 (Via Government Security News, h/t G.W.Schulz) The chief worry seems to be that food trucks carry 20 pound propane cylinders, get close to important landmarks, and would serve as an easy surveillance platform. 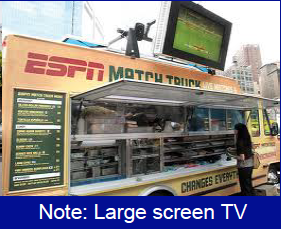 But some of the other things the report warns about are the fact that “roach coaches” are increasingly being replaced by gourmet carts and ESPN’s food cart has a large screen TV. Apparently, in addition to Ford being a suspected terrorist, ESPN is now a suspected front for a terrorist surveillance operation, complete with large screen TV showing sports? The thing is, in addition to threatening burgeoning small business growth, this fearmongering presents another problem: the last two real terrorist plots in NYC. As Schulz pointed out, the guy who thwarted Faisal Shahzad’s attempt to blow up Times Square was street vendor Duane Jackson, not the NYPD, which was instead busy profiling Muslim-owned businesses rather than the 7-11 that might have led to Shahzad’s hawala. And while Jackson’s handbag cart probably doesn’t have propane tanks, if we start treating street vendors generally as subjects of suspicion, we’re less likely to see the cooperation that Jackson gave. Food trucks may make great surveillance platforms, but that’s true of citizen observers like Jackson as much as terrorists. Real attacks the NYPD had no role in or even undermined but for which they claim credit. Those marginally credible plots involving government informants. Those plots deemed not credible by (usually anonymous) experts or never developed. That’s it. The “threats” the NYPD is using to justify profiling the city’s (and suburbs’) Muslims were either missed by the NYPD, created in large by them, or never really developed. I’d add just two things. First, as I have noted, for two of three actual attacks here, the NYPD actually got close but missed (or even hindered) the developing plots. These near misses suggest the NYPD may well have picked a few worthwhile investigation targets, but its actions are failing to reveal any real, rather than manufactured, threat. There’s one more thing Elliot’s piece made me realize. Several of these–including Uzair Paracha, Iyman Faris, and the NYSE/Citi plot–can be traced back to KSM. As Elliott notes–and I’ve noted before–some of his evidence against Paracha, at least, was collected during his worst period of torture. Not only does that suggest I should add “exploiting torture-induced testimony” to my title. But it makes me wonder whether one of the problems with trying KSM in NY, for Ray Kelly, was the possibility that KSM would expose the fraud at the heart of Kelly’s counterterrorism scam. I have twice before noted some curious details about Joby Warrick’s telling of the events leading up to Baitullah Mehsud’s death. I noted that it is another example–like the Iraq War–of an attack justified by nukes in which the nukes were ultimately never found. And I noted there are some significant differences between the NYT’s version of the story and Joby Warrick’s. Daniel Klaidman apparently tells his own version in his book, which I hope to read next week. Mind you, I’m not saying that any of these journalists is telling the complete story or even that any one journalist presents a story that is entirely true, I’m just noting that different Administration sources are feeding different stories. Last week Ben Wittes transcribed the complete passage from Klaidman’s book that describes how Rahm Emanuel decided to publicize Baitullah’s killing for political benefit. Here’s how Warrick describes the killing in his book. It was now 1:00 A.M. in the Paksitani village. Baitullah Mehsud, leader of the Pakistani Taliban and chief protector of the Jordanian physician Humam al-Balawi, now lay on his back, resting as the IV machine dripped fluid into his veins. At his feet, a pair of young hands, belonging not to a doctor, as the CIA supposed, but to his new wife, were massaging his swollen legs. Barely aware of the buzzing distance drone, oblivious of the faint hissing of the missile as it cleaved the night air, he took a deep breath and looked up at the stars. The rocket struck Mehsud where he lay, penetrating just below the chest and cutting him in two. A small charge of high explosives detonated, hurling his wife backward and gouging a small crater in the bricks and plaster at the spot where she had knelt. The small blast reverberated against the nearby hills, and then silence. Overhead, the drones continued to hover for several minutes, camera still whirring. A report was hastily prepared and relayed to Panetta at the White House. Now, the NYT reveals that some sources say there were other civilian casualties. Mr. Obama, through Mr. Brennan, told the C.I.A. to take the shot, and Mr. Mehsud was killed, along with his wife and, by some reports, other family members as well, said a senior intelligence official. This doesn’t mean Warrick’s version of the drones originally reporting there were no other casualties is incorrect on that front–after all, drones don’t provide perfect intelligence, contrary to what their boosters say, and it’s possible that reports of other casualties came later from HUMINT. But if there were other casualties, it probably means many of these cinematic details about the pinpoint nature of the strike–Meshud being cut in two and his wife being blown back but the strike leaving only a small crater–are not entirely true. Again, I’m not saying any of these journalists are fully capturing the truth; what they’re telling is what Administration sources have told them, and I doubt NYT and Klaidman’s sources have any less of an agenda than Warrick’s did. And note all the details about Mehsud’s death distract from the way we tried to get to him by first killing one of his clan-members, then targeting that man’s funeral, which Warrick does include; Warrick was reporting on our funeral targeting tactic before TBIJ did, to great controversy. But I am noting that this cinematic picture of very controlled killing (even the killing of a young woman who was probably pushed into this marriage as a teenager) comes from a decision from Rahm to push such picture for political advantage. One more thing. The killing of Mehsud’s commander and then Mehsud and his young wife and maybe her family, reportedly justified by intelligence on nukes that never materialized? Mehsud claimed direct credit for Faisal Shahzad’s attempted attack on Times Square, and al-Balawi killed 7 CIA officers at Khost in direct revenge for the killing of Mehsud. These are some of the most serious attacks on us or attempts in recent years, both stemming from this attack on someone whose aspirations to attack us may never have been real beforehand.